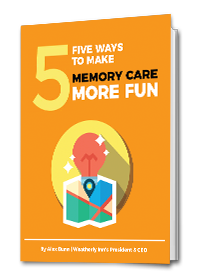 Download "5 Ways to Make Memory Care More Fun"
Caring for an aging relative can be a great challenge, especially when memory loss becomes a part of the equation. As time passes, it becomes more and more difficult to interact with your loved one, and greater assistance may be required. However, throughout the process, families and others providing care can experience joy, meaning, and yes...fun! How to create environments that bring memories to life! Ways to involve the whole family, a sure way to bring back memories and a smile to your loved one’s face. Activities that will connect the past with the present, get out and about with your loved one. The importance of making new friends and continuing a healthy social life. And relying on humor and fun to facilitate quality of life!